The homeland of the Sinningia Alliance is the Atlantic coastal forests of Brazil and this is where the majority of species are found in the wild. However, some species are found outside Brazil; mostly in Argentina, Paraguay, and Bolivia. The species with the greatest geographical range is S. incarnata, which has crossed the isthmus of Panama into Central America. 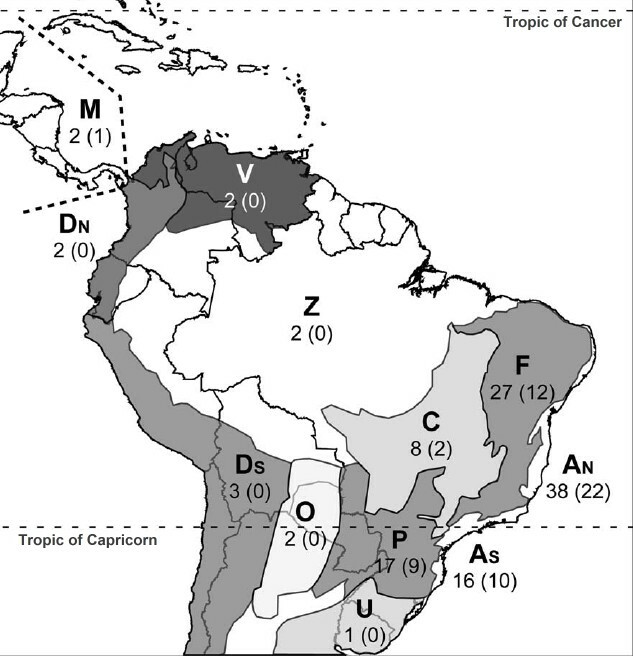 Biogeographic areas for Sinningieae species distributions in South and Central America. AN and AS are the portions of the Brazilian Atlantic rain forests that lie respectively north and south of the Tropic of Capricorn; F is the São Francisco region; P the Paran region; C the Cerrado region; O the Chaco region; U the Pampas in southern Brazil and Uruguay; DS and DN the southern and northern Andes; Z is Amazonia; V is northern Colombia, Venezuela, and the Guayana Highlands; M is Central America and southern Mexico. Numbers indicate the number of species occurring in each area, outside parentheses is the total, inside is the number endemic (limited) to the area. Map and description from Dispersal-Vicariance analyses in the tribe Sinningieae (Gesneriaceae), Mathieu Perret, Alain Chautems and Rodolphe Spichiger, Annals of the Missouri Botanical Garden 93 (Aug 2006).